Christians encounter hostility and subtle persecution in the United States and face open persecution in other parts of the world. We are called to turn the other cheek, but in what other ways would God have us respond? Standing Firm provides biblical perspectives to help understand the challenge of persecution and how God promises to guide, use, and sustain us. The following excerpt from the book discusses the resources that God provides for us when dealing with hostility. God works through us, giving us motivation and purpose, and He uses our circumstances to shape us and to achieve His plans. God also provides us with resources to deal with hostility. These resources include His presence, the authority and power entrusted to Jesus, the Holy Spirit who indwells us, and the understanding that God is in control. We are not left on our own to suffer hostility or persecution; God is alongside us for fellowship and to support and equip us. Think of God’s comforting presence to Enoch, father of Methuselah, who “walked with God.” Think of the profound assurance that David described in the familiar Twenty-third Psalm, where he describes having our Lord with him through the valley of the shadow of death, and looks ahead to dwelling in the house of the Lord forever. In the stress of the moment, as Elijah found after his conflict with the prophets of Baal on Mount Carmel, it is very easy to think that we are alone and on our own. Yet Elijah found that God had the situation well in hand all along. Our attention is drawn to the crisis rather than to the One who can see us through; this is part of our weak human nature. In fact, Jesus is with us during our entire tenure on the earth and to the end of the age. In the Great Commission recorded in Matthew 28:18–20, He declared, “All authority in heaven and on earth has been given to Me. Go therefore and make disciples of all nations, baptizing them in the name of the Father and of the Son and of the Holy Spirit, teaching them to observe all that I have commanded you. And behold, I am with you always, to the end of the age.” His presence gives us peace and assurance under fire, and this even includes “under fire” in a literal sense if we consider the experience of Shadrach, Meshach, and Abednego. It is our great privilege to walk with God, redeemed by Christ. It would serve us well to recall this every morning, asking in prayer simply to walk with Him step by step throughout the day. Jesus declared His authority in heaven and on earth when He announced the Great Commission, and His authority is central to our life and work under those marching orders. This is not a powerless, toothless authority, though. As reported throughout the Gospels, Jesus had already demonstrated His power over illness, injury, handicaps, hunger, winds, storms, demons, and death itself. In fact, during His years of public ministry, Jesus’ miracles showed His power over all parts of creation. These signs of power established His credentials, demonstrated His authority, and spoke clearly to believers as well as unbelievers. His is the name above all names, and His presence with us now and “to the end of the age” is active and potent rather than passive and powerless. 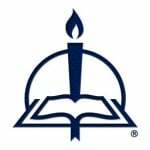 Working in His name and explicitly under His direction, we have moral authority and spiritual authority that cannot be defeated, even if we suffer persecution and death in the process. Further, and at Jesus’ request, God sends the Holy Spirit to sustain, strengthen, and comfort us. The Spirit gives us words when we need them, He teaches us from the Word, and He is our Helper, dwelling in us. The unambiguous reality of the presence of Christ and the indwelling Holy Spirit fueled the confidence and deliberate boldness exhibited by the disciples following Pentecost. The disciples, who had been cowering in a locked room and dreading the worst, were transformed into fearless witnesses standing and declaring the Gospel of Christ before a crowd of thousands at Pentecost. God did not choose to spare them from beatings, jail, or other forms of suffering, but they were so transformed that they thanked God for the opportunity to suffer for His name. Suffering was really nothing for them compared to the joy of telling others about Jesus. The Holy Spirit can likewise strengthen our faith to see beyond our present circumstances and fix our gaze on the Savior we love. We really need to understand and grasp the idea that God is entirely sovereign; He does not stand back, but actively rules. There is a reason that Scripture calls Him the living God more than twenty-five times; He is living, active, and imminent. He did not create this world just to step back and watch it run; He is actively involved in this world, in my life and in yours. Further, God’s support is not just a reaction to whatever the evil one can throw at us; He knows exactly what is coming and is entirely in control. The simple fact remains that God is in charge, and the evil one and our persecutors—despite their lies and bluster—are not. Pilate learned this lesson directly when Jesus looked him in the eye and told him that he had no authority except what had been given him from above. This is a huge source of courage, to know that the One who loves us the most is in complete control of all that we experience, including the bad parts of life. We may not fully understand the situation now, and we may not understand it even until the day God takes us home to heaven, but still we know our sovereign Lord and Savior. From Standing Firm: A Christian Response to Hostility and Persecution, pages 109–11 © 2015 Jesse Yow, published by Concordia Publishing House. All rights reserved. 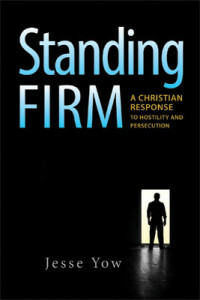 To order Standing Firm, please contact CPH at 800-325-3040 or visit www.cph.org.